Beth Vogt was here earlier this week talking about finding beauty in imperfection. If you missed it, you can read the post here:) Today we're taking time to check out her newest book, Crazy Little Thing Called Love. Beth's one of my favorite contemporary romance authors, so I've been waiting for this book to release. It came out earlier this month, and I was excited to get my hands on it. Here's the blurb, and we'll chat on the other side. First, I'll admit to pure excitement over the setting of this book. Destin, Florida is one of my favorite places to be, so seeing it front and center in Vogt's book only created a familiar feel for this story. Beyond that though, the characters were two I truly enjoyed growing to know. Both Vanessa and Logan are well fleshed out with believable struggles that lend themselves to their conflict. It makes sense why these two aren't together, and there's enough to question whether or not this reconciliation will happen. But, it's a contemporary romance, so the reader goes into the book knowing the happily-ever-after will happen, and Vogt does not disappoint! Being able to balance that given and yet entertain a reader is no easy task, and Vogt delivers along with laughter and grace and just enough unexpected moments to keep the reader turning the page. And the wedding when it finally arrives? Definitely worth every minute leading up to it. Another great book by Beth Vogt. 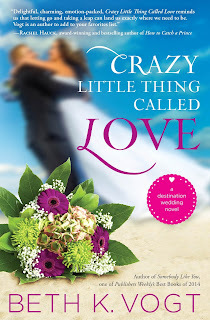 A clean romance with two engaging leads, a spiritual thread that isn't preachy, and a sigh-worthy ending, Crazy Little Thing Called Love is the must-read beginning to this new series. Thank you, Susan, for your review of Crazy Little Thing Called Love! So welcome! It's a great book!